March gives me many reasons to smile. Winter is finally losing its grip. Daylight lengthens. Certain joyful personal anniversaries and “real life” occasions pop up like spring flowers. Anticipation grows for the Faire. (THE Faire!) And Fun abounds in the opportunity to Make Stuff for two of my favorite hunts, Twisted and Steam. The picture above shows Spyralle’s prize for the Steam Hunt XIII. The theme is Wonderland. 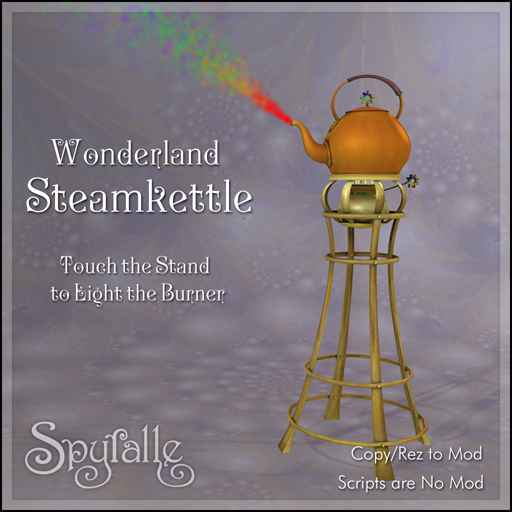 I imagined a useful object for a mad tea party, a teakettle on an oil burner, handy at table-side, all brass and tarnished copper and a bit of tongue in cheek ornamentation. It is very cleverly scripted by Tai, my scripting partner and co-conspirator. You turn on the burner, and after a few seconds rainbow steam comes out of the spout. 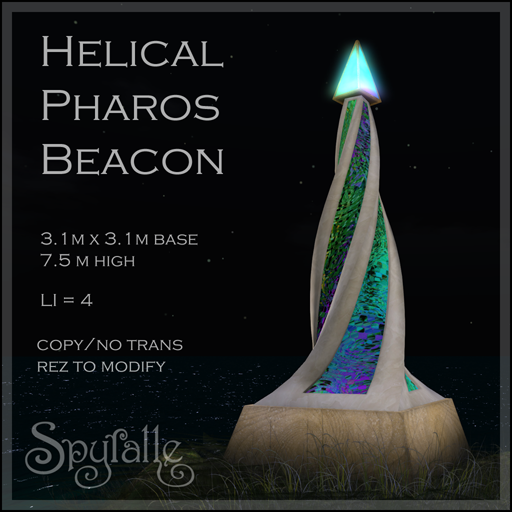 The Helical Pharos Beacon is for the Spring 2018 Twisted Hunt, theme: Atlantis. This is the third in a series of Spyralle beacons featuring a spiral or helix in the construction of the mesh. This one is a twisted pyramid (appropriate, no?) suggesting ancient Egypt and Greece. Hunts, I was once told, are a waste of time for designers. I disagree. Hunts let a creator experiment and try new directions, without worrying about sales – although they do serve their marketing purpose very well, I’ve found. Hunts let you make something out of the imagination, for the pure joy of Making. This entry was posted in Hunts and tagged Home and Garden, Hunt, Spyralle, Steampunk, The Twisted Hunt. Bookmark the permalink.